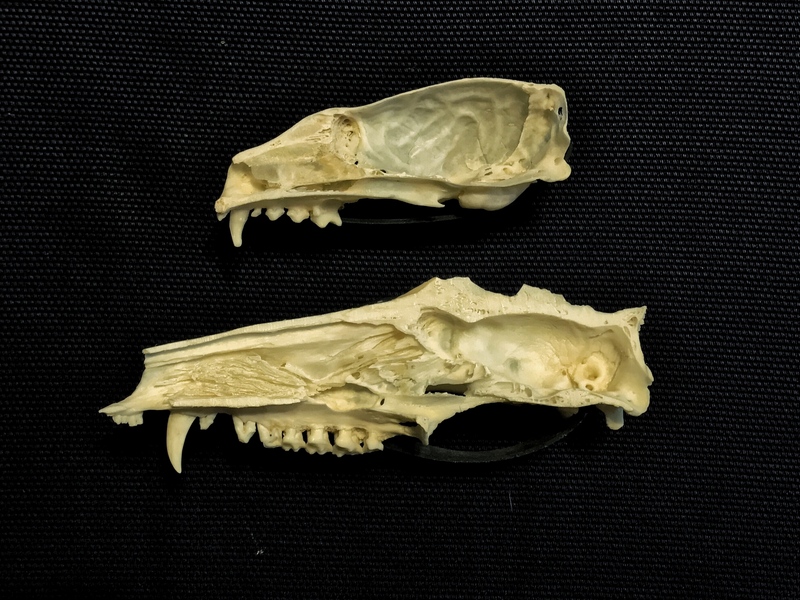 Marten skull on top, opossum on bottom. Internal (medial) view of the right half of each skull. These have been in my collection for ages, I just hadn’t gotten around to posting pictures. I don’t remember where I got them, but they were definitely purchased rather than collected. It’s funny, I remember the origin story of almost every bone and skull I’ve collected myself, but stuff I’ve bought tends to slide out of recollection. I assume the marten is the American marten, Martes americana, but I haven’t keyed it out. The opossum is definitely Didelphis virginiana. I think the opossum skull was already hemisected when it came to me – at least, I can’t find the other half. The marten I did myself, with a Dremel. In part because I wanted to compare the size and shape of the braincases. 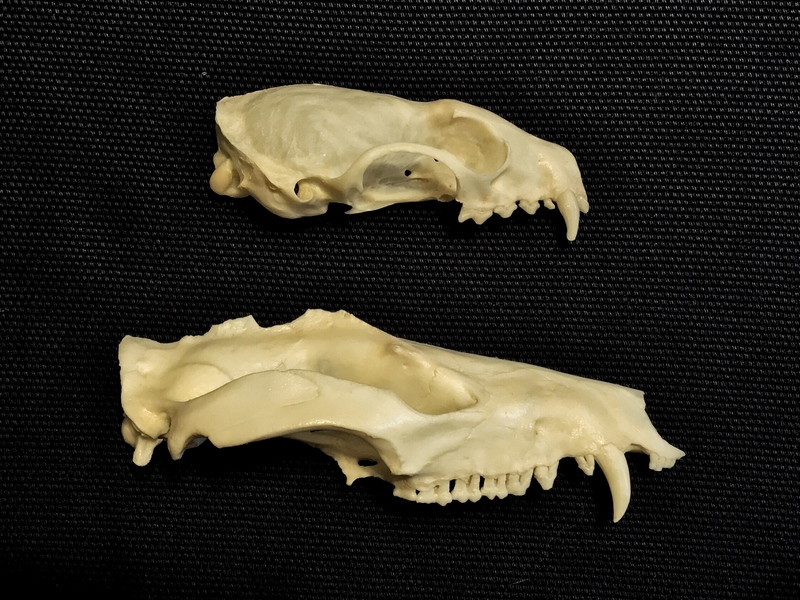 As you can see from the photos, the marten had a big wrinkly brain that left impressions on the inside of the skull, and these are visible externally through the thin walls of the braincase. Now, I am an opossum fan, but I will be the first to admit that the osteological evidence does not imply a lot of brainpower for North America’s only resident marsupial. Apparently its brain was small and smooth, untroubled by any thoughts more complicated than trash can access. Images of opossum brains online confirm that impression (or maybe lack of impression, since we’re talking about braincases here). And yet, opossums are still around, thriving in the face of placentals with our wrinkly brains, high metabolisms, regular garbage collection, and whatnot. Long may they scurry. Opossum brains are actually rather small *even compared to other marsupials*. The only species I can think of that outdo them are bandicoots and the giant “air-headed” diprotodonts (which show a negative correlation with brain size correlated with the development of massive cranial sinuses). Though there are some weird exceptions like the genus Philander in the tropics. The funny thing is opossums aren’t even all that old of a group. The group seems to have radiated about 25 Ma and the subgroup that includes the large familiar species like the Virginia opossum is probably only about 7 Ma old. For reference that’s not too far off from when apes first appeared and humankind split off from chimpanzees, respectively. I didn’t know any of that – thanks for posting! The last time I was at the Field Museum in Chicago, 20-0dd years ago, there were mounted skeletons of a variety of mammals, including a marten (I think– it may have been some similarly sized mustelid) and a quoll: one of the Australian dasyurid marsupials that used to be called “Native Cats.” Nice comparative pair! Similarly sized carnivores with over-all not too different skeletal proportions. One noticeable difference, however, was that the placental had much more skull length BEHIND the jaw joint than the marsupial, showing a much larger braincase. Pretty sure the neurons are roughly the same size. Most neuroarchitecture is super-conserved, especially at the cellular level. It is interesting how different animals get enough mental horsepower (for want of a better term) out of brains that are proportionally or absolutely small. There are dwarf plethodontid salamanders with correspondingly tiny brains that fire their tongues to capture prey – in that case, miniaturizing the brain does not seem to have simplified their behavior. One thing I am curious about is how much of the brain (by mass or neuron count) animals need for cognition vs. running the body. Maybe tiny salamanders can get away with having tiny brains because their tiny bodies just don’t require that much integration to run – possibly their little brains are much more “calculator” and much less “body control”. I’m speculating out of ignorance here, but it’s something I’m interested in, so if anyone knows more, please share!